Well, I think this may be my last monthly post about our BIG two year old Ford! 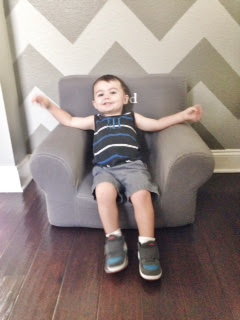 Don't fret, you will still see a LOT of Ford updates and pictures (duh) but I think I have to stop referring to Ford's age in months now that he is 2. 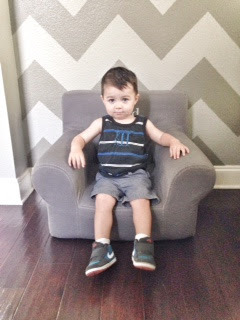 This past month has been fun, our little smarty pants continues to amaze us (and crack us up) everyday with the things he says, I can't imagine how fun the next year will be! 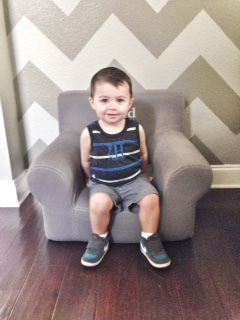 When I dragged his chair over to the wall this morning he said, "Oh mama take picture!" and sat down to smile. I love this kid! Had his 2 year well check today and has a double ear infection, boo. This kind of explains his crankiness as of lately. We picked up his prescription and hoping it does the trick soon. Other than that, he is healthy as a horse and incredibly smart! We will go back in a few weeks for a flu shot but no shots needed this time and no more appointments til 3 years! Very polite these days and says "No Thanks!" if he doesn't want to do something. It is adorable. He also says please and thank you without being prompted. Gives a lot of compliments... "ooh mama your earrings are pretty." or "your dress is nice". Not sure where he learned it from but I love it! Asks a lot of questions (yep we are entering that stage). What is that sound? What are you doing mama? Where is daddy? Describes things, "hot, warm, cold, spicy, sour"
Obsessed with bandaids and boo boos. About 10 times a day he needs kisses on his fingers or knees for boo boos and asks for bandaids. Yep he is one of those weird kids! Loves Mickey Mouse Clubhouse and yells out their names when we are in the car "Mickey! Minnie! Goofy! Donald! Daisy! Pluto!" Went on his 27th flight this month to Colorado and loved it! He has been obsessed with airplanes ever since my gramma flew in to meet Lucy, "Gramma Great on airplane!" Getting to be a pretty good eater. He is finally eating veggies (cooked carrots, broccoli, zucchini), more meats, all fruit, tons of milk. We just transitioned him to 2% milk this week, he didn't notice at all. He regressed in potty training on our trip but we are back on track he has very few accidents and has been waking up dry from nap. He whipped and nae-nae'd. I AM DYING!! And the chips, "sour!" He is just the most precious thing! I can't believe he's already 2! I love how curious he is with all his questions!